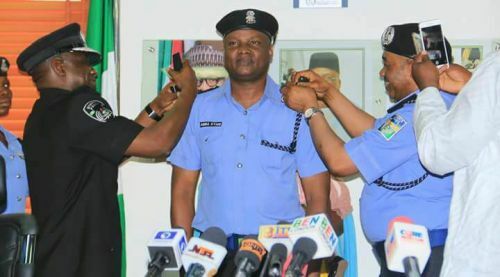 he inspector General of Police, Ibrahim Idris has promoted the policemen who participated in operations that lead to the death of the notorious killer, “Vampire” in Imo state. A facebook user, Muhammad Mammadi Maisarauta who also got promoted shared the news. 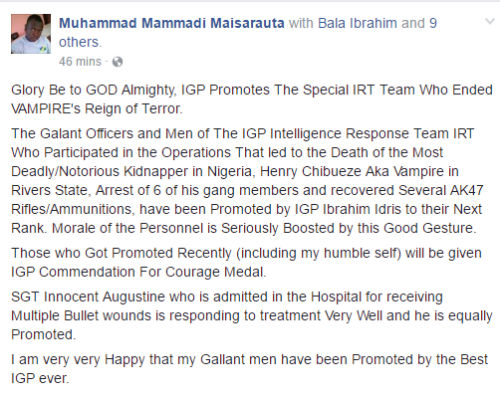 “The Gallant Officers and Men of The IGP Intelligence Response Team IRT Who Participated in the Operations That led to the Death of the Most Deadly/Notorious Kidnapper in Nigeria, Henry Chibueze Aka Vampire in Rivers State, Arrest of 6 of his gang members and recovered Several AK47 Rifles/Ammunition, have been Promoted by IGP Ibrahim Idris to their Next Rank. Morale of the Personnel is Seriously Boosted by this Good Gesture. Those who Got Promoted Recently (including my humble self) will be given IGP Commendation For Courage Medal. SGT Innocent Augustine who is admitted in the Hospital for receiving Multiple Bullet wounds is responding to treatment Very Well and he is equally Promoted.